Is @JonathanLittle's opponent bluffing on this river? See if he calls or folds with his small pair. 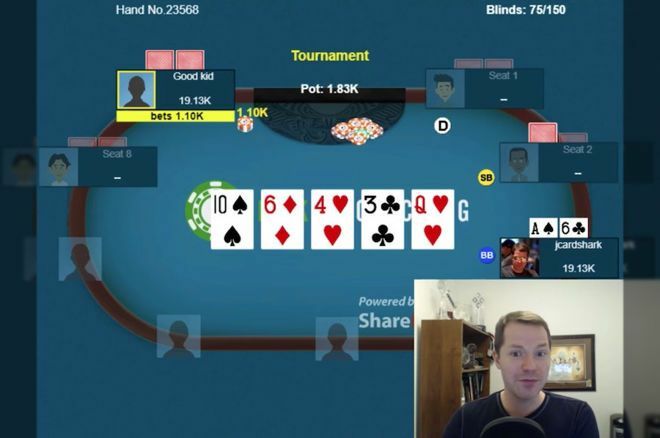 Tournament hand analysis: @JonathanLittle tries to play from out of position with ace-rag. Here's a tournament hand in which I find myself playing ace-rag from out of position — not exactly the best spot in which to be. We were pretty deep-stacked (about 130 big blinds deep) and with the blinds at 75/150 a good, young player raised to 375 from the cutoff. I had in the big blind and defended with a call. As I note in the video below, ace-six offsuit is not a good hand to play, especially when out of position, but to a small open like this one (2.25x) it is probably worth defending. The problem is is often going to make a lot of marginal holdings at best, which you obviously don't want when first to act. The flop came to pair my six. I could see leading on a more coordinated board with my middle pair (or with good draw), but on a dry board like this checking makes more sense. Especially when out of position, I want to keep the pot manageable if I can. My opponent bet 500 and I called, and the turn brought the . I checked again, and this time my opponent checked behind, suggesting I probably had the best hand at this point. So ace-rag worked out for me after all in this instance. Note how I took into consideration as well how passively I'd played the hand up to the river, which tends to encourage opponents to bluff more.